Lopez: "Everybody enjoys watching Thiago"
Munich - Marcos Lopez, 38, is Spain’s most renowned football analyst. Holder of a full coaching badge, the former AS Roma sporting director currently works as an expert for the sports daily Marca, radio station COPE, Marca TV as well as private channels La Sexta and Antena 3. His opinion is regarded very highly in Spain, not just among the media, but also by clubs wanting to find out more about teams and players. He gives university lectures about tactics and systems, among others with the current SSC Napoli coach Rafael Benitez. In an interview with bundesliga.com, he spoke about the role Thiago Alcantara could fill at FC Bayern, how he can still improve and where Bayern lie on the European landscape. bundesliga.com: Mr. Lopez, you've been following and analysing the development of many players for years now and your opinion on Bayern’s new signing Thiago is bound interest Bundesliga fans. When did you first notice Thiago? Marcos Lopez: The first time I noticed Thiago was when he was 14, 15 years old. On the one hand his natural talent caught my eye, while on the other , it was because he’s the son of Brazil’s World Cup winner Mazinho. When he was still in the FC Barcelona youth team, you could already sense that he was going to take that last step up into the first team given his individual class. The way he plays football catches the eye immediately and everybody enjoys watching him. bundesliga.com: Despite all the praise, some people - not the Bayern fans - in Germany were asking whether it was necessary for FC Bayern to sign Thiago, given the quality they already had in their treble-winning squad. Why did Guardiola desperately want the European Under-21 Champion? Lopez: Bayern have a huge squad, without a doubt, but Pep has his own ideas and concepts of football. He loves combination football and some of his concepts will be new to a few Bayern players. Thiago is a player who fits into this concept and he can show the players the way, meaning Guardiola does not have to explain his ideas too much. Thiago can make the work easier for his team-mates. I believe that a player like Toni Kroos can grow alongside Thiago. When they are both on the field together, then that’s a great midfield duo. bundesliga.com: German football is regarded as more physical and more aggressive than Spanish football. Could that cause Thiago problems and prevent him from showing his true colours here if people go at him harder? Lopez: It’s very important for Guardiola that the players are in the right position. Collisions shouldn’t therefore take place - what matters is playing the ball on cleanly. The FC Barcelona players were often criticised for not really going into the tackle. The fact is they don’t just want to hoof the ball out when they go into a tackle. They avoid contact with the opposition so that they can play the ball out cleanly and establish a quick transition from defence to attack. I think the ball will be played around very quickly at Bayern, like it is at Barcelona. When the ball is played at a particular speed, then the opponents will always be too late to reach it and so there shouldn’t be too many collisions between players. bundesliga.com: We saw Thiago in the Telekom Cup pushing forwards a lot from a defensive midfielder position. Where do you think his best position would be for FC Bayern? Lopez: Thiago has got to be moving around in the opponents’ penalty area. If he only plays as a defensive midfielder, then he can’t show off his full quality. As a defensive midfielder, Guardiola needs a player who can turn defence into attack quickly, but that is not Thiago’s strength. I prefer to see him as a central midfielder who is always in the opponents’ half where he can cause problems to the opposition’s defensive midfielders and play to his strengths. Overall, I think Thiago’s best position is as the most advanced central midfielder in a 4-3-3 formation. bundesliga.com: The German media are positively surprised by Thiago’s qualities. You’ve known him for years. Where are his weaknesses, if he has any at all? Lopez: He's still growing as a footballer and he still has to learn a few things, he has not reached his peak yet. I think he’s got to be clever and adapt himself to the characteristics of German football if he wants to improve. That’s what Javi Martinez did so successfuly. Martinez has taken a leap in quality with what he has learnt in the Bundesliga. Thiago is a player who can make the difference in the opposition’s half. Of course, he can nutmeg players in his own half or look for a neat touch there too, but he’s got to limit things like that. Thiago will improve without a doubt. He's still growing and it’s a learning process. He's been trained very well in the FC Barcelona youth academy and very few have his ability to play the inch-perfect pass. bundesliga.com: Our readers will also be asking why such a player did not appear so frequently for FC Barcelona. Is it fair to say he didn’t really make the grade with the Catalans? Lopez: There are hierarchies at FC Barcelona. After winning so many titles in recent years, there are players at FC Barcelona whose status simply is never up for discussion. That status only damages those who are rising through the ranks, or those who want to improve. Thiago had every right to demand more action, but at the end of the day, it was always the same important players who would play. 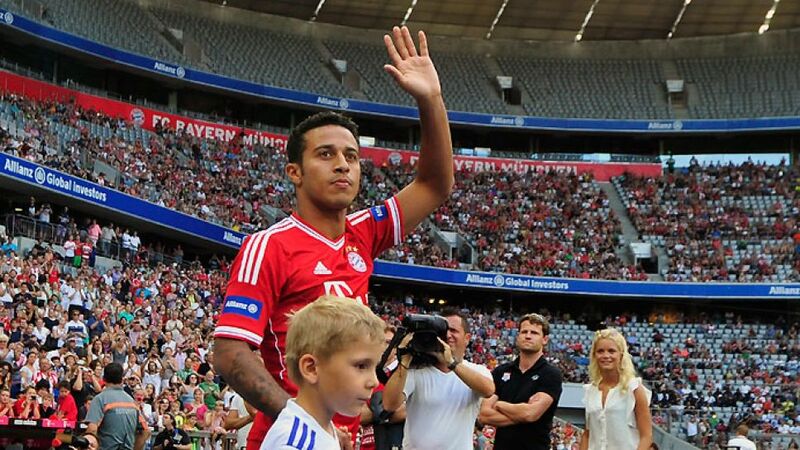 Therefore, I believe there’s nothing odd about Thiago leaving. He knew there's a wealth of players for his position at Barca, which is why he left. He even turned down an offer from Manchester United FC to join Guardiola, even though Bayern already have many top midfielders.